Dr. M.N. Rajeevan the Director of Indian Institute of Tropical Meteorology (http://www.tropmet.res.in/) in Pune tells this writer exclusively by email “The Chennai flood was caused due to continuous rainfall activity concentrated over coastal Tamil Nadu, around Chennai between 28th Nov – and 3rd December. “However, rainfall during 01-02 December at Chennai (around 35 Cm) was an extraordinary event; Recent studies suggest that such heavy rainfall spells are increasing and may increase in future due to global warming. The Chennai flood is caused due to above normal rainfall activity during the northeast monsoon season (October to December). The above normal rainfall during the season was expected as this year is an El Nino year and we can expect above normal NE Monsoon rainfall during El Nino periods” adds Dr. Rajeevan. El Nino or climate change, the third dimension of the Chennai floods is encroachment of water bodies (courtesy the political class) that act as natural drainage in coastal ecosystems. “T Nagar is an affluent residential suburb in Chennai today but it is built on ponds that were clogged by developers and builders between 1978 and 1981”. “After the Mumbai flood of July 2005 a committee of which I was a member, recommended that water weirs have to be redesigned and constructed to drain high tide water that lashes the city. But this water continues to remain in the city’s cemented environment; - clogged and unable to discharge into the sea; no action seems to have been taken to mitigate such future disasters” said Dr. Arun Bapat noted geologist, speaking exclusively to this writer. El Nino is a term that refers to the reversal of the normally anticlockwise cold Humboldt Current that hugs the Chilean coast in the South Pacific Ocean and coursing instead in a clockwise motion, thus reversing seasons corresponding to a latitude-longitude calibration right across the whole world. El Nino is notorious for exacerbating weather systems bringing unseasonal weather almost around the whole world and in places where there is no unseasonal weather, the weather heaves gargantuan impacts. Thorough documentation is the first step towards preparedness. El Nino exacerbates all hydrometeorological calamities - Avalanches, Blizzards, Cloudbursts, Coastal Incursion, Cyclones, Droughts, Desertification, (differential impact of) El Niño Southern Oscillation, Epidemics, Floods, Flash Floods, Famine, Forest Fires, Fog, Hailstorm Landslides, Mudslides, sand storm, Sea surge, Storms, squalls, thunderstorms and urban floods. Tsunamis triggered by ice berg melt and seamount explosions may also construe hydrometeorological disasters by definition atleast. Overground peat emissions in Indonesia spawn forest fires; and fog in Indonesia being exacerbated by El Nino events of 1998 and 2015 has been documented. Understanding geological phenomena like El Nino helps documentation so we know better in the future. Sea level rise corresponds to the sinking of riparian deltas thanks to the deposition of silt say the purists. Quantifying the Subterranean peat emissions of methane from deep underground by source will strengthen the case for reduction in emissions. The melting permafrost formed in Siberia 11,000 years ago is developing massive sinkholes with one being recorded as 70 metres deep and 600 metres in diametre. Hydrometeorological disasters will have increasingly debilitating impact on vulnerable communities and Island States in the decades ahead if emission targets are not met. That the geological perspective of climate change is significant (http://ete.cet.edu/gcc/?/volcanoes_teacherpage/) was also supported by a study of the Earth and Environment, University of Leeds which quantified the emissions from Iceland’s Bardarbunga volcanic eruption of summer 2014 @ 120,000 tons of sulphur dioxide gas per day at the onset of its eruption completely outdoing the industrial emissions in Europe. According to the NASA website on volcanoes’ connection to Climate change ((http://ete.cet.edu/gcc/?/volcanoes_teacherpage/) this is because sulphur dioxide is cooling in comparison to CO and CO2 emissions that obtain from industrialisation and vehicular emissions. According to a new study on the subject -- published in the Journal of Geophysical Research, Atmospheres http://onlinelibrary.wiley.com/doi/10.1002/2015JD023638/full -- the volcano's toxic emissions bested the average amount of sulphur dioxide produced by European industry, by a large margin. “The eruption discharged lava at a rate of more than 200 cubic metres per second. In the study, we were concerned with the quantity of sulphur dioxide emissions, with numbers that are equally astonishing: In the beginning, the eruption emitted about eight times more sulphur dioxide per day than is emitted from all man-made sources in Europe per day” Dr Anja Schmidt School of Earth and Environment, University of Leeds said in a press release (http://www.ed.ac.uk/news/2015/volcano-230915). Its significance lies in emphasising the natural, benign sources of global cooling like volcanic emissions. There are many other examples of volcanological perspective of climate change. Lake Toba’s super volcanic eruption 74000 years ago robbed the earth of sun rays triggering the Ice Age. Krakatau super volcanic eruption in the Java Straits in August 1883 triggered a short term climate change globally, inducing spectacular sunsets on the Chesapeake Bay near Washington DC on the East Coast of the United States for months after the super volcanic eruption of 1883. In Bengal in India the Sun could not be sighted for a decade. 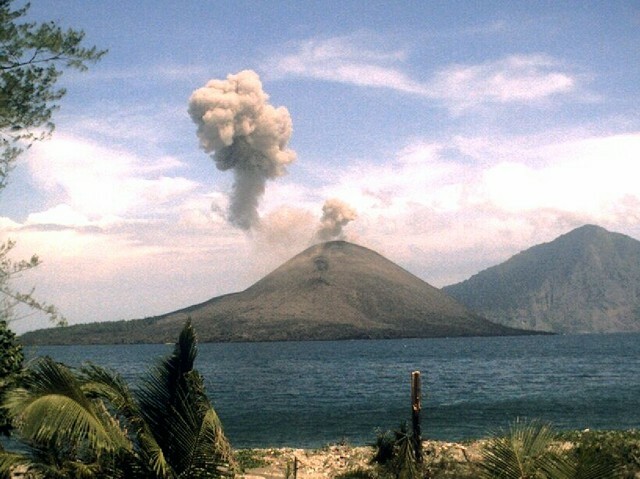 “But a decade after the Krakatau super volcanic explosion”, - seismologists – like Dr. Arun Bapat allude to the transient nature of short term climate change – “wherever the ash of Krakatau had fallen, the agricultural lands became very fertile for six to eight years following the volcanic eruption”. The Tambora super volcanic eruption in Sumbawa in Indonesia triggered the Year Without a Summer in Canadian Eastern Sea Board in 1815 - 16. 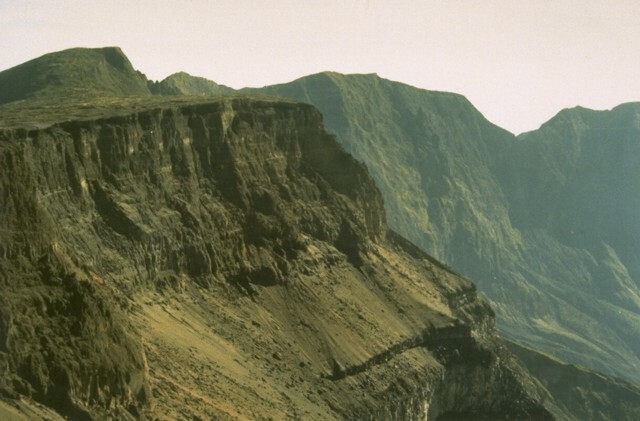 It took a decade for the global climate to stabilise after Tambora’s eruption. Climate scientists worry at the rapid pace of glacial retreats triggered by fossil fuel emissions and anthropocentric triggers like vehicular emissions. It only underscores the need for planned development - a challenge to the political elites in the current World Order. But geologists are sceptical of glacial retreat being triggered by anthropocentric emissions. “Last Glacial Maximum Period is also a matter for study. It has been observed that most of the glaciation – there is evidence to suggest that major glacial advancement happened 50 – 55000 years ago, but it is still being worked out, but after that period there have been 3 – 4 periods of glaciations and de-glaciation. Glacial advancement and recession is a climate change cycle. It is not happening for the first time, we have those records. There is a geological cycle to it…” says Professor Rameshwar Bali Associate Professor of Geology at the Centre of Advanced Studies in Geology, Lucknow University. Retired Dean of Institute of Socio Economic Change (http://www.isec.ac.in/) Professor R. S. Deshpande says “modelling micro climate for long period average is difficult given that micro climate itself is affected by terrain, waterscape, landscape, humidity, precipitation (rainfall / snowfall) wind speeds etc. Lat long calibration of long term global climate is correspondingly diverse and challenging. Climate change has over the millennia shaped climate change adaptation - change in cropping patterns and consumption of agricultural produce”. The earth’s axis varies between 220 and 24.50 according to the Milankovitch Cycle http://earthobservatory.nasa.gov/Features/Milankovitch/). Milutin Milankovitch, a prisoner of Stalinist Russia in Siberia during the 2nd World War hypothesized that the speed of the earth’s revolution on its elliptical orbit is altered by the velocity of the earth’s rotation on its axis once in about 41000 years triggering a change in the angle of the earth’s tilt from an elliptical to circular orbit… thus making climate change inevitable. This change in the tilt of its axis alters the amount of Sun’s radiation falling on earth – accounts for change in seasons drastically in the middle and higher latitudes (Our Changing Climate Fall 1994 – Volume 4 http://www.atmos.washington.edu/~dennis/RTN4.pdf) by Dennis Hartmann, University of Washington. Such changes inevitably have impact on zoological and biological diversity. Speaking exclusively to this writer, Professor R. Sukumar of the Centre for Ecological Sciences at the premier Indian Institute of Science in Bangalore, said “Climate change is an ongoing phenomenon over the past millions of years. Between the Pleistocene Era (around 2.6 million years ago to about 10,000 years ago) which marks the beginning of the Holocene era there were about 25 periods of glaciation and inter glaciation with warmer climes lasting shorter periods. The Last Glacial Maximum being the coldest period of glaciation occurred about 20,000 years ago. The cooling trend would have started much before that. Cold periods were also arid periods as rainfall declined. During such cold periods the tropical moist forests would have shrunk or contracted to small areas. … These places are referred to as Pleistocene Refugia. In India only two such shrunk places were there … in the extreme southwest and northeast of the subcontinent. Elephants were confined to these refugia during extremely cold periods. Mammals like apes, antelopes, bats, cheetahs, wild dogs, elephants, rhinos, wild dogs, hippos, giraffe, birds like ostriches, reptiles like snakes, crocodiles, etc have all been documented by studies of Kurnool Caves by G.L. Badam et al (http://www.rhinoresourcecenter.com/pdf_files/127/1272188698.pdf). Interestingly Asian Elephants started moving out of Pleistocene Refugia in extreme southwest (Southern Western Ghats) only when the climate became warmer supporting tropical broad leaved forests. It seems like the fauna found in Africa today were all once endemic to the Indian subcontinent too, but have gone locally extinct … as a geomorphological adaptation of climate change. What is not so easy to comprehend is the cyclical pattern of El Nino. The pattern of the notorious El Nino cycles desperately needs to be studied accurately, if only to be prepared for the catastrophic impact the geological cycle has on agriculture, fishing, food security and global economy. Given its varying cycles and its differential impacts on micro climate right across the world, modelling El Nino triggered extreme weather globally has become the greatest challenge of our times. Could it be that volcanic eruptions in the South Pacific Ocean plausibly determine the course of currents accounting for reversing the normally anticlockwise course of the Humboldt Current on the west coast of Chile in the South Pacific? It thus alters the normal course of hydrometeorological cycles right across the world offsetting the hydrology and currents in each Latitude and Longitude… accounting for the variations in agro meteorology, fisheries, shipping, and global economy. The role of seamounts in the South Pacific Ocean in warming the waters of the South Pacific Ocean and also in reversing the normally anti clockwise cold Humboldt Current to a clockwise course / rotation demands credible attention too (http://wattsupwiththat.com/2012/02/15/do-underwater-volcanoes-have-an-effect-on-enso/). It is only when we understand the geological perspective of climate change can we do accurate justice to mitigation. The transition from the Chennai floods to El Nino to global warming is managed well. The research is thorough. Thanks for sharing the article and writing it, Malini. "Twenty thousand years ago our planet was an icehouse. Temperatures were down six degrees; ice sheets kilometres thick buried much of Europe and North America and sea levels were 130m lower. The following 15 millennia saw an astonishing transformation as our planet metamorphosed into the temperate world upon which our civilisation has grown and thrived. One of the most dynamic periods in Earth history saw rocketing temperatures melt the great ice sheets like butter on a hot summer's day; feeding torrents of freshwater into ocean basins that rapidly filled to present levels. The removal of the enormous weight of ice at high latitudes caused the crust to bounce back triggering earthquakes in Europe and North America and provoking an unprecedented volcanic outburst in Iceland. A giant submarine landslide off the coast of Norway sent a tsunami crashing onto the Scottish coast while around the margins of the continents the massive load exerted on the crust by soaring sea levels encouraged a widespread seismic and volcanic rejoinder. In many ways, this post-glacial world mirrors that projected to arise as a consequence of unmitigated climate change driven by human activities. Already there are signs that the effects of climbing global temperatures are causing the sleeping giant to stir once again. Could it be that we are on track to bequeath to our children and their children not only a far hotter world, but also a more geologically fractious one?"